When doing the Criss Cross you will want to speed through and skip the good stuff. But, can you go a little deeper and twist a little more? 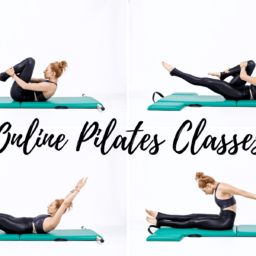 Like Double Straight Leg Stretch, Criss Cross seems to have been added to the mat practice after Joseph Pilates created his order. And, because it has so many elements of the rest of the work it's common to do it with the rest of the ab series. I think Criss Cross is a great way to teach the body how to twist and bend. Something it will need when you get to Saw on the mat. And, while it's hard to maintain a lift in your chest as you do your criss-cross it is much easier to do it here than when you are sitting up and your stomach is facing gravity like in Saw! Twist, then a little more and a little more as you reach your leg away. From Double Straight Leg Stretch keep your hands behind your head and pull one knee into your chest with your center. Stretch your other leg out long to the diagonal and then curl up and over to your bent knee. Like Saw, maintain the opposite hip on your mat and twist more. Then as you switch sides avoid the temptation to lower yourself towards the mat and roll over to the other side. Repeat this 3-5x each side. Some things to watch out for on this exercise is the knee that is pulling in. Maintain it along your midline. It will want to cross your midline and make you think you are twisting when you are really just pulling your leg closer to your elbow. Press your hands and head into each other and pull the elbows wide. It's tempting to bring your elbow to your knee and there are even those who will say "elbow to knee." But, what they really mean is armpit or opposite chest to opposite knee. Each rep try to see how much you can really twist your waist and how far to the side you can really go without rolling!